Friday, October 5, 2018, 5:00 p.m.–Tuesday, November 6, 2018, 8:00 p.m. The drawn, painted, printed, and cast works in this exhibition represent a wide exploration of techniques and processes. Produced over several years and in collaboration with master artisans, Jenene Nagy's images and objects reveal a continued inquiry into the basic materials that help to shape our world. As an invited guest Nagy produced these works in collaboration with Matthew Letzelter of Watershed Center for Fine Art Publishing & Research, Sue Oehme of Oehme Graphics, Frank Janzen of Crow's Shadow, Jennifer J. Woodward of Pulp and Deckle, and Karen Kunc of Constellation Studios. Nagy is a visual artist living and working in the Inland Empire. She received her BFA from the University of Arizona in 1998 and her MFA from the University of Oregon in 2004. Nagy’s work has been exhibited nationally and internationally at venues including the Portland Art Museum; Weatherspoon Art Museum, in Greensboro, North Carolina; Southern Exposure in San Francisco; and Takt Kunstprojektraum in Berlin, among others. Her work has been recognized with grants and awards from the Foundation of Contemporary Art, the Oregon Arts Commission, Colorado Creative Industries, and the Ford Family Foundation. Along with a rigorous studio practice, Nagy is one half of the curatorial team TILT Export, an independent art initiative with no fixed location, working in partnership with a variety of venues to produce exhibitions. From 2011 to 2012 she was the first curator in residence for Disjecta Contemporary Art Center in Portland, Oregon. Her work is represented by Samuel Freeman Gallery in Los Angeles, PDX CONTEMPORARY ART in Portland, and Michael Warren Contemporary in Denver. This exhibition is presented as part of a larger collaboration between Augsburg University, Bethel University, the Minneapolis College of Art and Design, and St. Catherine University in conjunction with the publication of Kenneth Steinbach's book, Creative Practices for Visual Artists (Routledge, 2018). 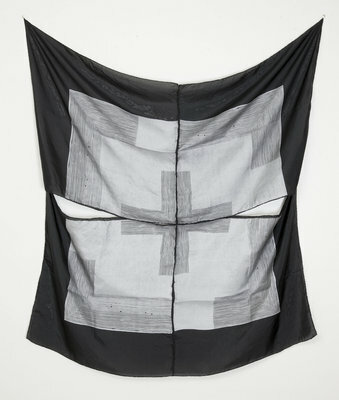 Image credit: Jenene Nagy, flag (surrender 4), 2018, oil woodblock print on silk 46"x46". Printed at Constellation Studios Lincoln, NE.